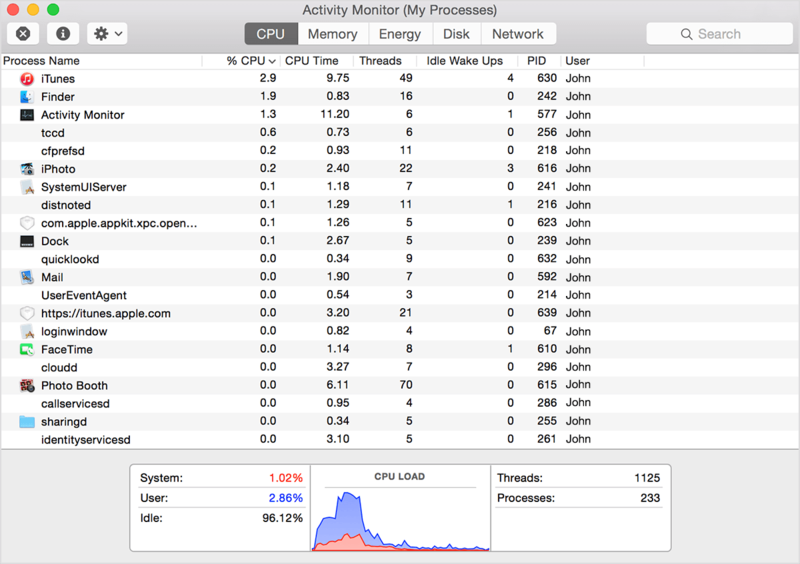 This article describes some of the commonly used features of Activity Monitor, a kind of task manager that allows you see how apps and other processes are affecting your your CPU, memory, energy, disk, and network usage. 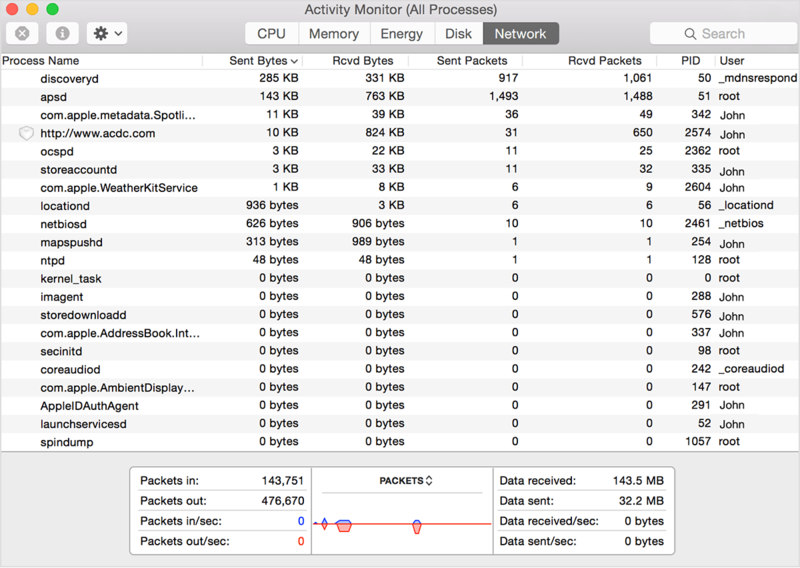 Open Activity Monitor from the Utilities folder of your Applications folder, or use Spotlight to find it. CPU Load: The percentage of CPU capability currently used by all System and User processes. The graph moves from right to left and updates at the intervals set in View > Update Frequency. The colour blue shows the percentage of total CPU capability currently used by user processes. The colour red shows the percentage of total CPU capability currently used by system processes. Wired Memory: Memory that can’t be compressed or paged out to your startup drive, so it must stay in RAM. The wired memory used by a process can’t be borrowed by other processes. The amount of wired memory used by an app is determined by the app’s programmer. Swap Used: The space used on your startup drive by macOS memory management. It’s normal to see some activity here. 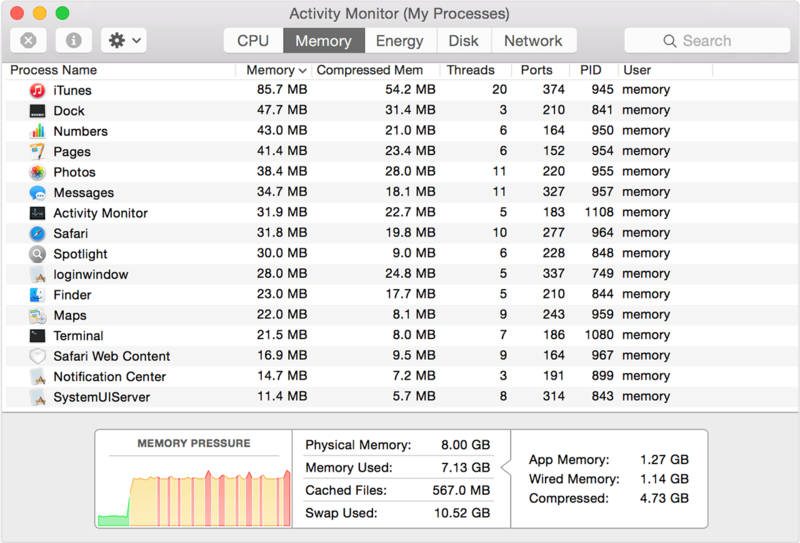 As long as memory pressure is not in the red state, macOS has memory resources available. Cached Files: Memory that was recently used by apps and is now available for use by other apps. For example, if you’ve been using Mail and then quit Mail, the RAM that Mail was using becomes part of the memory used by cached files, which then becomes available to other apps. If you open Mail again before its cached-files memory is used (overwritten) by another app, Mail opens more quickly because that memory is quickly converted back to app memory without having to load its contents from your startup drive. Energy Impact: A relative measure of the current energy consumption of the app. Lower numbers are better. A triangle to the left of an app’s name means that the app consists of multiple processes. Click the triangle to see details about each process. App Nap: Apps that support App Nap consume very little energy when they are open but not being used. For example, an app might nap when it’s hidden behind other windows, or when it’s open in a space that you aren’t currently viewing. Graphics Card: The type of graphics card currently used. Higher–performance cards use more energy. Macs that support automatic graphics switching save power by using integrated graphics. They switch to a higher-performance graphics chip only when an app needs it. “Integrated” means the Mac is currently using integrated graphics. “High Perf.” means the Mac is currently using high-performance graphics. To identify apps that are using high-performance graphics, look for apps that show “Yes” in the Requires High Perf GPU column. Battery (Last 12 hours): The battery charge level of your portable Mac over the last 12 hours. The colour green shows times when the Mac was getting power from a power adapter. As energy use increases, the length of time that a Mac can operate on battery power decreases. 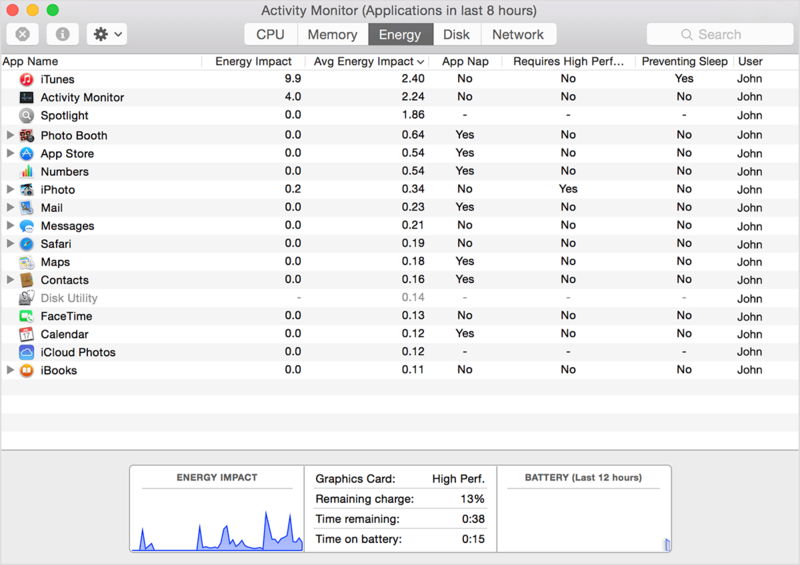 If the battery life of your portable Mac is shorter than usual, you can use the Avg Energy Impact column to find apps that have been using the most energy recently. Quit those apps if you don’t need them, or contact the developer of the app if you notice that the app’s energy use remains high even when the app doesn’t appear to be doing anything. The Disk pane shows the amount of data that each process has read from your disk and written to your disk. It also shows “reads in” and “writes out” (IO), which is the number of times that your Mac accesses the disk to read and write data. The information at the bottom of the Disk pane shows total disk activity across all processes. The graph moves from right to left and updates at the intervals set in View > Update Frequency. The graph also includes a pop-up menu to switch between showing IO or data as a unit of measurement. The colour blue shows either the number of reads per second or the amount of data read per second. The colour red shows either the number of writes out per second or the amount of data written per second. The information at the bottom of the Network pane shows total network activity across all apps. The graph moves from right to left and updates at the intervals set in View > Update Frequency. The graph also includes a pop-up menu to switch between showing packets or data as a unit of measurement. The colour blue shows either the number of packets received per second or the amount of data received per second. The colour red shows either the number of packets sent per second or the amount of data sent per second. 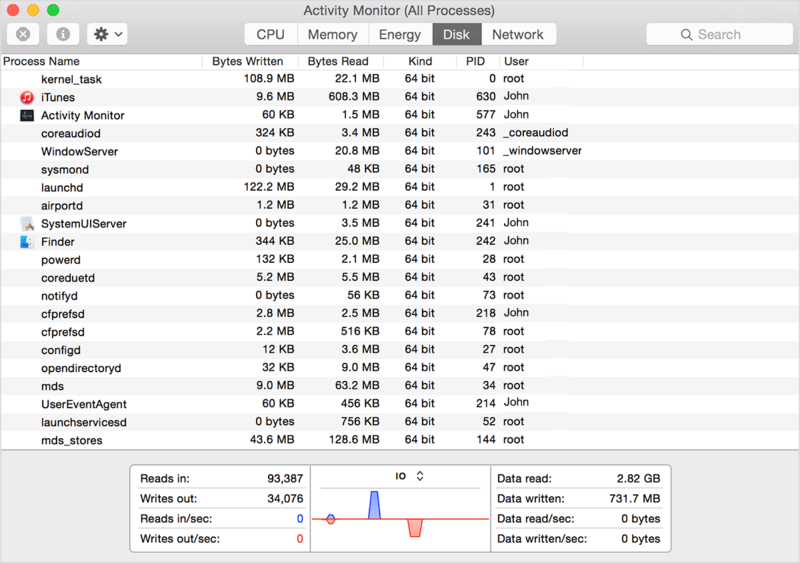 Learn about kernel task and why Activity Monitor might show that it’s using a large percentage of your CPU.